This new comprehensive guide details the best systems, products, and techniques for designing and building homes that can weather nature's fury. After Hurricane Katrina, I visited New Orleans to write about what survived. Years before, I had visited the site of an F4 tornado in Maryland—houses swept off foundations, exploding roofs, chimney failures. Those seemed like freak storms then. Now, they feel like warnings of what was to come. Green Builder Media's new how-to reference guide addresses the country's need for safe havens, homes, and other structures that allow us to keep working and dreaming amidst the coming tempests. The (Building) Science of Readiness: Years of hard experience with hurricanes and tornadoes have taught us a thing or two about how to build tougher homes. Storm Front: A case study of a stilt home in the Florida keys, built like a fortress with Structural Insulating Panels (SIPs), is also a state-of-the-art energy saver. Resilient Product Showcase: A closer look at some of the best products for adding strength, durability and flexibility to a structure. Safe Havens: Adaptability is the key to designing buildings that can perform well, even when the air conditioners and gadgets shut down. Floods and Folly: Will cities such as Houston be ready when the next big one hits? This guide is brought to you courtesy of Huber Zip System, Fox Blocks, Honeywell, the National Fire Protection Association, and the Structural Insulated Panel Association. 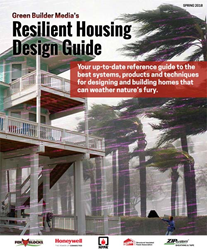 Download your free copy at https://www.greenbuildermedia.com/download-resilient-housing-design-guide. Green Builder® Media, LLC is the nation’s leading media company focused on green building and sustainable living, affecting positive change by providing inspirational information to over 200,000 progressive building professionals and 38 million consumers who are interested in sustainable living. With a comprehensive suite of content marketing, digital, social, and print media options, high-profile demonstration projects, market research, and live events, Green Builder Media offers a blend of visionary and practical information covering a broad spectrum of sustainable living topics, including Internet of Things, smart home technologies, energy efficiency, water conservation, indoor air quality, resilient housing, renewables and clean transportation. For more information, visit http://www.greenbuildermedia.com.